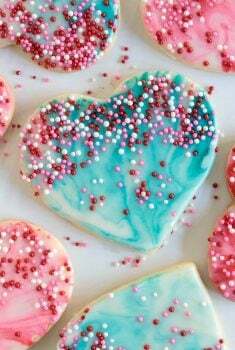 These buttery Easy Valentine Shortbread Cookies are melt-in-your-mouth delicious. They’re tried and true and a perfect project for kids. 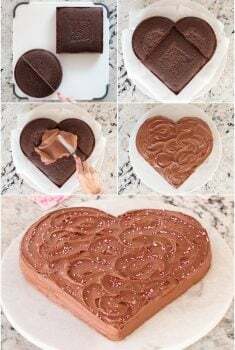 A plate of these Easy Valentine Shortbread Cookies would be a wonderful and delicious way to send your love to family, friends, neighbors, teachers, hairdressers – anyone on your Valentine’s list! We’re actually sending Valentine greetings from London, where we’re spending time with our daughter and her family. It’s only been a little over 48 hours since we arrived, but I feel like we’ve already packed in a week’s worth of fun and activity. But we never tire of being pedestrians here in London, as there are always so many interesting sights along the way, as well as the ever-present excitement and hubbub of a large city like this. We’re actually planning a whole post coming up called Who Wants to Visit London in February? 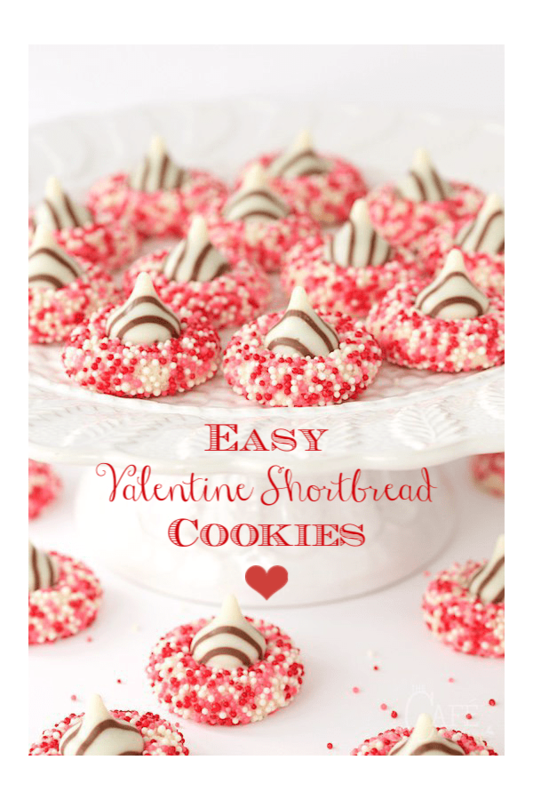 but today I just had to share these easy, fun and delicious Easy Valentine Shortbread Cookies. 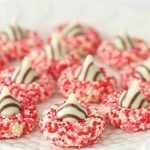 The base recipe for these Easy Valentine Shortbread Cookies is an old favorite of mine from Land O’Lakes. It couldn’t be simpler, with just five ingredients blended together, then rolled in small balls. In the original recipe, the dough is rolled in balls, the centers are filled with jam and the cookies are baked to create Raspberry Thumbprint Cookies. 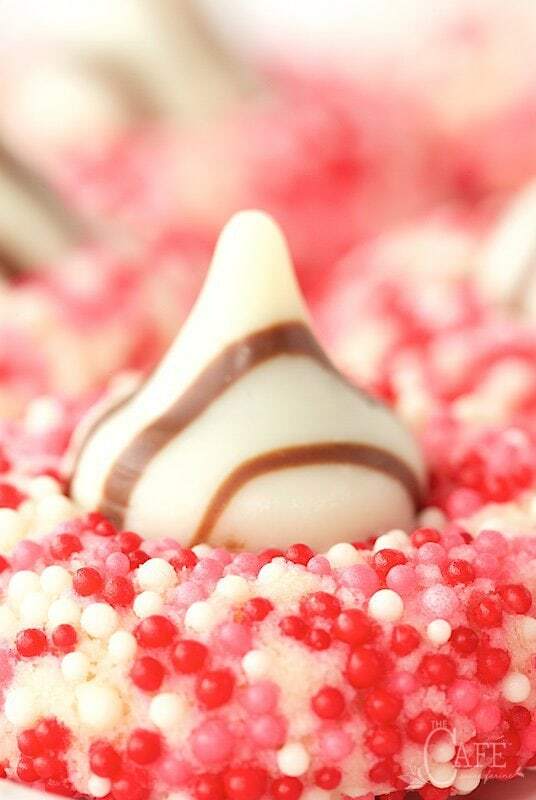 This time, after making small balls of dough, I rolled them in red, pink and white sprinkles. And after they were baked, while still hot, I tucked a Hershey’s kiss in the center. 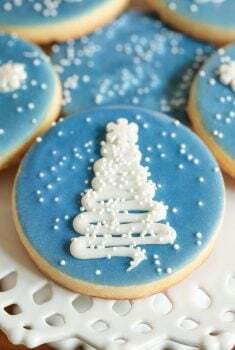 As you can see, these festive, pretty-as-a-picture cookies are created with minimal work. Because it’s such an easy recipe, this is a great treat to make with kids. In fact, I brought everything along with me to London so we could make these cookies together as a Valentine sweet treat. I know my little herd here in London will be thrilled when I pull out the sprinkles and Hershey’s Hugs. Don’t tell them yet though, I want it to be a surprise! Well, I’m going to run walk and pick up my girls from school. 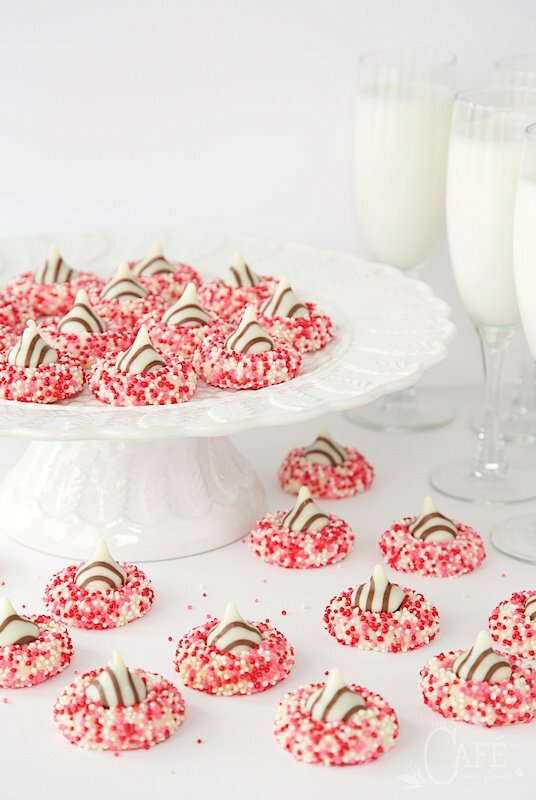 I hope you surprise your Valentine(s) with a batch of these whimsical, fun and delicious Easy Valentine Shortbread Cookies. They’re a wonderful way to say “I love you”, “I like you”, “I care about you”, “I’m glad you’re my friend”, “Thanks!” or whatever your Valentine wishes might be! These buttery cookies are melt-in-your-mouth-delicious. They're also easy and a fun activity for kids. Heat oven to 350°F. Pour sprinkles into a shallow bowl. Unwrap Hershey's Hugs and set aside. Combine butter, sugar and ½ teaspoon vanilla extract in a mixer bowl. Beat at medium speed, scraping bowl often, until creamy. Roll balls of dough in sprinkles, patting sprinkles gently onto any areas where sprinkles have not adhered. 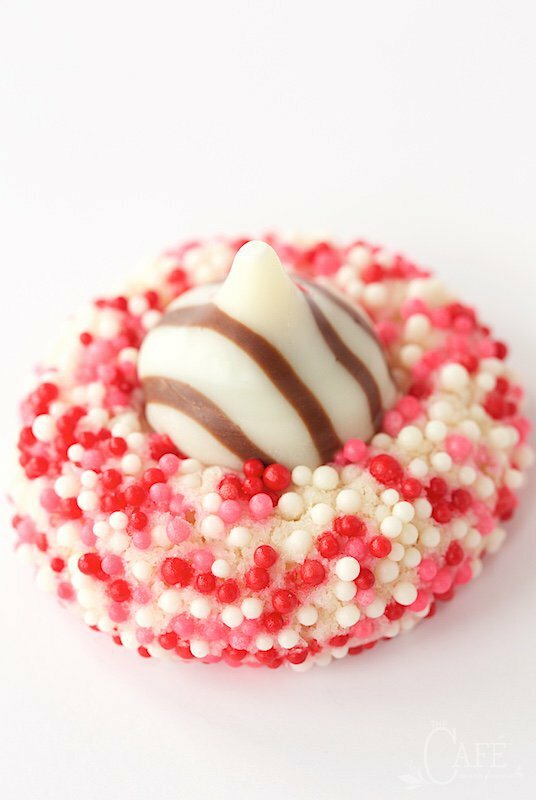 You want to have the little balls pretty much completely covered with sprinkles. Place 2 inches apart onto ungreased cookie sheets. Bake 14-18 minutes or until bottoms are lightly browned. Remove from oven and let cool for a minute or two then quickly place a Hershey's Hug in the center of each cookie, barely pressing down (about ¼ inch or less!) into the cookie. Don't be tempted to press the kiss too deeply into the cookies as they will crack at the edges. If you do have any cracking, gently push the crack back together while the cookies are still warm. 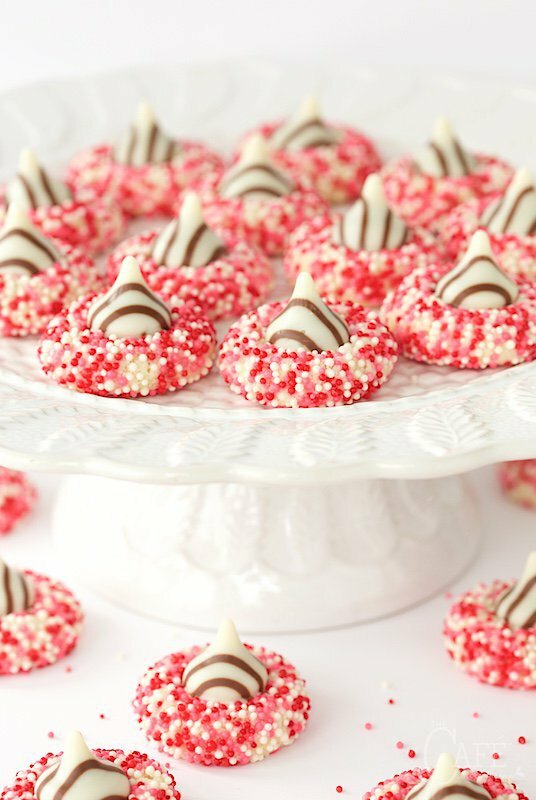 To keep the kisses from melting, transfer cookies to a plate or small cutting board and refrigerate for 20 minutes. If you don't refrigerate them, the kisses will take quite a while to firm up. Be careful when you move them so the kisses don't collapse or distort in shape from the movement. So easy to make – and delish!! I always have trouble with my ‘kisses’ melting!! And I did this time, too. What’s the secret?? Pinning!! Thanks Donna! Let the cookies cool for a minute or two, pop the kiss on and stick the cookies in the refrigerator for 10-15 minutes. That should do it! Chris they are just beautiful! I can’t wait to see some photos of the family. Thanks Claire! We’ll get some up, probably later this week! Lots of fun family times right now! I love those little hug Kisses. Beautiful idea and once again fantastic photos, Chris. AHA! I remember how you teased us with a pic of this beauty on Instagram 🙂 … I’ve been waiting for it since. It’s so beautiful Chris, perfect for V day! Have a terrific Valentine’s Day and a wonderful visit. These cookies are absolutely wonderful! Perfect little nuggets for sharing! Thank you and Happy Valentine’s Day! Well I believe you are going to please some little ones come Valentine’s Day. Enjoy your visit with your family, I know they are happy to have you visiting. Thanks Karen! It’s always a pleasure for us to travel to see them anywhere! 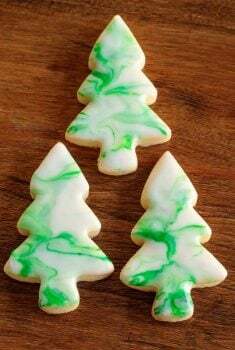 Beautiful cookies, so well done. Don’t forget to take pictures of those grandkids, love seeing the pictures of them! We will Karen! Scott’s been snapping away since we arrived yesterday in the French Alps! Those are absolutely adorable, Chris! I must make a batch to share…. I know I couldn’t eat just one. That sounds so exciting Beverley! We’ll have to take you up on that! What a gorgeous little treat that is sure to warm anyone’s heart. But I bet those beautiful girls will adore them! They are just about to make them here in the French Alps – with snow all around Tricia! Beautiful Chris and would be so fun to do with kids (can’t beat sprinkles and kisses 🙂 Glad you’re having a great trip. I think London is perfect in any month! Despite the cold and gray, we’ve also had some bright, sunny blue days too. And everywhere we go we see tiny hints of spring! It’s just around the corner! These look really good! (The pics and the recipe;) Can’t wait to try them and see if gluten free flour will work as well. Have you ever tried that? I may use almond flour. Enjoy London and your family time. Hope to see you when you return home. Thanks Paula! I’ve never done them with gluten free, but it’s definitely worth a try! Hi Chris, I love spending time doing the everyday things with my grandkids too, you really get to experience what they do on a daily basis. You and your gang are going to have so much fun in the kitchen, these thumbprints are beautiful. So true Cheri! Scott and I always have a blast with them in the kitchen, and they seem to really appreciate the one-on- one time! I’ve always had a soft spot for thumb prints — sharing! Have a wonderful Valentine’s Day, Chris! Chris, you always make the most beautiful food – simple, or otherwise! That’s so sweet Dawn, thank you! You crack me up Debra! Thanks so much for your encouraging comments!